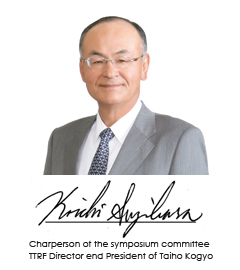 I am pleased to announce that TTRF and Taiho Kogyo will hold “TTRF-TAIHO International Symposium on Automotive Tribology 2019”. The significance and purpose for holding symposium are to progress tribology research, exchange advanced information that applicable to automotive technology, and strengthen industry-university collaboration in this field by describing current situation and future potential. I am looking forward to your participation, despite your busy time. Thank you for reading this announcement. Download of proceeding is available on Programme page. The website has updated for TTRF - TAIHO International Symposium on Automotive Tribology 2019. The symposium was successfully held on Apr. 18, 2018.